At the center of our galaxy lies a swirling, energy-spewing supermassive black hole called Sagittarius A* or Sgr A*, for short. For billions of years, surrounding gas and dust have been falling into it. Every 10,000 years or so, it swallows a nearby star. Sgr A* (pronounced Saj-A-star) is the largest black hole in our night sky, but we don't know what it looks like up close because we've never been able to take a picture of it. This is actually true of all black holes. They're ubiquitous in our universe, but they're so small in the sky, we don't have a detailed image of any of them. Those pictures you see on the web or in TV documentaries are illustrations or simulations based on indirect evidence—observations of the region of space around the black hole. Scientists don't doubt black holes exist, but without an image, they can't prove it for certain. This all may be about to change. 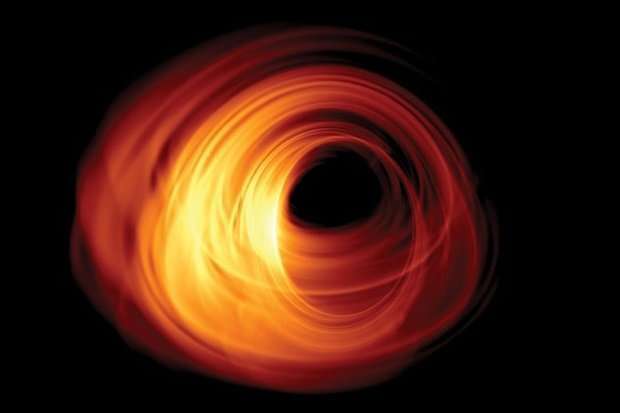 For the last four years, professor of astrophysics John Wardle has been working with a team of roughly 200 scientists and engineers to create an image of Sgr A* that would be our first ever picture of a black hole. The initiative, called the Event Horizon Telescope (EHT), finished collecting data in April 2017. Researchers are currently analyzing it. This may not seem like much but generating this rough of a picture of Sgr A* is the equivalent of reading a newspaper headline on the moon while standing on Earth. In fact, it is good enough to answer some of our biggest unanswered questions about one of the universe's most mysterious phenomena: What do light and matter look like as they fall toward a black hole? What are the streams of energy shooting out of black holes made of? What role did black holes play in the formation of galaxies? Though it's unlikely, results from the EHT could even require adjustments to Einstein's general theory of relativity. But before we get to whether one of the greatest scientists who ever lived didn't get it quite right, we have to start with the basics. Black holes typically happen when a very massive star burns through its nuclear fuel and collapses cataclysmically into an incredibly dense point, or singularity. When gas, stars and other matter come close enough to the black hole, they are drawn toward the black hole's event horizon, an imaginary shell around the singularity. Nothing that passes across the threshold of the event horizon can escape the black hole's gravitational pull. And as matter falls in, the black hole gets more massive and the event horizon expands. It turns out that black holes are everywhere. Supermassive ones lie at the center of most galaxies. Less massive black holes are much more common. Our galaxy, the Milky Way, likely has around 100 million black holes, though we've only identified a few dozen of them. As for Sgr A*, it's about 26,000 light-years away from Earth with a mass four million times that of the sun. That makes it "wimpy" compared to other supermassive black holes, Wardle says. The other supermassive black hole the EHT studies, Messier 87 (M87) at the center of the Virgo cluster, has a mass of nearly seven billion times that of the sun. The EHT chose Sgr A* and M87 because they are the largest supermassive black holes when viewed from Earth. They're the easiest and most accessible candidates for study. But how can we take a picture of a black hole when it's black? Good point. In fact, black holes are as black as the blackness of space. Any light that enters never escapes. But around a black hole, there is light from a luminous swirl of superheated matter yet to fall into the black hole. When the light passes near the event horizon, it bends and gets distorted by the pull of the black hole's strong gravity. This lensing of the light outlines a dark region called the black hole's shadow. The size of the shadow is expected to be two and a half times the size of the event horizon. The size of the event horizon is proportional to the mass of the black hole. For Sgr A* that works out to be about 15 million miles in diameter. And the diameter of M87, the other black hole the EHT is studying, is a thousand times larger than that. You get the picture: By studying the black hole's shadow, the EHT researchers can figure out a heck of a lot about the black hole. So technically speaking, the EHT's scientists won't be producing an image of a black hole. They will be using information about the shadow to deduce information about the black hole. But since imaging a black hole isn't an option (at least not at present), scientists consider an image of the shadow conclusive evidence of a black hole's existence. When Wardle started out in astrophysics in the late 1960s analyzing radio waves emitted by galaxies, "black holes were just a curiosity that may or may not have existed," he said. "They were a slightly disreputable field for an astronomer to be in." But a few years later, the field exploded, and since black holes power energetic jets that emit radio waves, he naturally gravitated in their direction (no pun intended). As part of the Brandeis Radio Astronomy Group, Wardle studies "active galaxies," a relatively rare type of super-luminous galaxy with supermassive black holes at their center. Sgr A* is so small in the sky that we don't have one single telescope on Earth that can see it in enough detail to create a high-resolution photo. The EHT scientists overcame this by networking seven telescopes around the globe using a technique called very long baseline interferometry (VLBI). The result was a "virtual telescope" with the resolving power of a telescope the size of the diameter of Earth. For a week in April of 2017, all seven of the EHT telescopes were recording signals from Sgr A*. Seven atomic clocks recorded the time of arrival of the signals at each telescope. The nature of the signals and when they arrive at each telescope will enable scientists to work backward to construct a picture of Sgr A*. This is going to take a while to complete. The EHT telescopes collected enough data to fill 10,000 laptops. Wardle is especially interested in finding out more about the massive jets of energy that stream from black holes. The jets form when matter outside a black hole gets heated to billions of degrees. It swirls around in what's called the accretion disk. Some of it passes the point of no return, the event horizon, and enters the black hole. But black holes are messy eaters. Some of the matter will be spit out in the form of tightly focused (collimated) jets. The jets travel at close to the speed of light for tens of thousands of light-years. It's possible that there are no jets coming from Sgr *A. It's not been very active in the last few decades. What are they made of, electrons and positrons, electrons and protons, or electromagnetic fields? How do they accelerate to nearly the speed of light? How do they stay tightly focused? Up until very recently, evidence supporting the theory of general relativity (GR) has come from observations of our solar system. But conditions in our little speck of the universe are pretty mild. The extreme conditions found near a black hole will put GR to the ultimate test. GR should accurately describe how light bends as the black hole's massive gravitational pull curves spacetime and draws everything towards it. The data gathered by EHT will provide measurements of this phenomenon which can be compared with Einstein's predictions. GR's formulas also suggest that the shadow cast by the accretion disk around Sgr A* will be almost circular. If it turns out to be shaped like an egg, it will tell us something is wrong about GR as well. Wardle thinks GR will hold up under testing. Still, there's always the chance GR "may have to be adjusted," he said. "Then we'll be in a severe straight jacket because you can't make changes that mess up all the other bits that do work. That would be very exciting." Those 200 "scientists" will undoubtedly do everything they can to make the black hole look like it is expected to look by their maths guesswork. Another spewing forth of Thornhill's EUist dogma. Grow up. you scientifically illiterate poser. Errr, yes we have known that for some time. It seems to break down at the very smallest scales. It would appear to need combining with a theory of quantum gravity. However, at every scale that it has been tested so far, it passes with flying colours. Which I'm sure is extremely annoying to cranks of various flavours. Physics matured from a qualitative science to a quantitative science centuries ago. Math is necessary to measure the relative ability of various hypotheses to explain observations, i.e. to identify which ones do better and which ones do worse. Complaints about "maths guesswork" invariably come from people who performed poorly in math at school and are unnecessarily frightened and suspicious of it. The solution is to go back to school and learn more math, not loudly proclaim one's ignorance in every other post. Hey Benni and the PseudoScienceCrowd, you know who you are! This is right up your alley. What do you predict the photo will show once the data is analyzed? Surely it can't be the shadow of a BH, exactly as Relativity predicts? Been there, tried that! None of them have got the cojones to predict that they won't see anything. It'll be a massive conspiracy to pretend that they have seen something! Among hundreds of scientists at various telescopes around the world, and two independent groups who will be given access to the data to confirm or deny the conclusions of said scientists. And all this to keep down a bunch of scientifically illiterate loons who believe Earth used to orbit Saturn, and Venus came flying out of Jupiter a week ago last Tuesday! P still strongly opinionate that most of the resistance to the concept of Black Holes? Is internalized sub-conscious bigotry of the ignorant wankers against using the terms "Black" or "Dark". It is probably too late to cure the stupid-ridden woo cultists of their cherished anti-science, anti-human bunkum. However. I would suggest replacing BH designation with Stygian Obstinacy. Cause, hey, it's funny! Which is as good a lack of reason as any. A black hole is a 2d object, so from the side it's gonna look like a line. Errrrm no, I don't think so. Why would a 3-d neutron star collapse into a 2-d object? Got any links? Nope just another one of my crank theories. Gravity is so strong that only sub-atomic particles remain. Also requires that all black holes spin, which creates a disc with a singularity at the center. Neutron stars spin. Very quickly. They aren't flat. Neither is the Sun. Or Earth. Just saying. We have nuclear forces to keep the structure of the elements intact which creates the 3D structure of matter. With the case of black holes we only have subatomic particles, so not necessarily "2D" but maybe a few particles thick, similar to Saturn's rings, in theory. What does a black hole look like through a telescope? For want of imagery and not graphical representation, the article prompted searching Google images, under the heading "what does a black hole look like through a telescope"
As there are copious graphical representation there is not a ccd imagery as yet, but we have only started on the on this quest, as photographers dream of the first one to lay claim of the first digital image, as from that moment blackholes will appear in the lime light, no longer demur, but well dressed, always having that moment for that photo opportunity. When was it that the BH was predicted to have jets? Oh right, never! And there isn't a legitimate proposed mechanism to explain it. However, polar jets are an expected and predictable result of a plasmoid not to mention numerous other examples expected morphologies. "What does a black hole look like?" "So technically speaking, the EHT's scientists won't be producing an image of a black hole. They will be using information about the shadow to deduce information about the black hole." "But since imaging a black hole isn't an option (at least not at present), scientists consider an image of the shadow conclusive evidence of a black hole's existence." The title leads us to believe they're gonna produce an actual pic of a BH, then change it to "shadow". More dark stuff from Pop-Cosmology, October 15, 2018 by Lawrence Goodman, Brandeis University. Hey Larry, ever hear of the Inverse Square Law? Probably not, so I would advise you to study it & learn why gravitatational collapse cannot occur at the core of a stellar mass to create INFINITE DENSITY as it's most basic criteria for existence. Yeah, Larry, zero gravity at the center of EVERY stellar mass in the entire Universe, capiche? No, probably you don't. Does that also explain the sun's jets and the peanut heliosphere we're all cruising around in? Do you mean like an old 78 RPM vinyl record?
" enough data to fill 10,000 laptops." Would that be my old laptop with 10GB of memory, or a newer one with 10TB? To image that elusive of character our yet to be most beloved most famous celebrity time and space has known since god in his vacuous wisdom of the vacuum that is space placed our first cosmic egg of existence, just as our starlets emerge babe in arms from their starry nurseries complete with planetaries for life in binary orbit of their starry starlet - blackholes we so desperately seek as due to their light-radius no light pass's that radius our earthly camera's rely on photonic reflection on our ccd's such that god in his spatial wisdom has placed his barrier of existence to his very existence as to view a blackhole within its light-radius is to view gods earthly existence as no matter how deeply we seek this blackhole of singularity existence like the cat in that of that invisible cat neither cat nor singularity can ever be seen so that photographers dream is a long forgotten dream of the infinite vacuous vacuum that is space! ......yep, you would expect that eventually the Pop-Cosmology aficionados would discover the immutable Inverse Square Law whereby denying a concentration of mass that reaches INFINITE DENSITY at the core of a stellar mass because there is no gravity there to create such a preposterous mass. > Lawrence Goodman, Brandeis University: It's been over a day since I put up my challenge for YOU to prove the Inverse Square Law is NOT immutable, instead you've allowed your acolytes to be here starting up yet again on their usual name calling rants & nothing but stone cold silence from YOU. C'mon here Larry, man up? Prove you're smarter than this Engineer with six years of Engineering School Education in Nuclear/Electrical Engineering & almost another two years of continuing education credits beyond that. You up to the challenge? GO FOR IT!!!!!!!! Sure why not, it just keeps on spinning, and if it's gold will last for ever. Thanks for going along with my joke. But others may not have realised that it was only that, which is why I am clarifying our exchange so that those who were not smart enough to understand it, might now wake up to that fact. C'mon here Larry, man up? Prove you're smarter than this Engineer with six years of Engineering School Education in Nuclear/Electrical Engineering & almost another two years of continuing education credits beyond that. You up to the challenge? GO FOR IT!!!!!!!! You are not a nuclear engineer, and you know sh!t about nuclear physics. As proven. It is just one of your D-K inspired fantasies. Lawrence Goodman, Brandeis University: It's been over a day since I put up my challenge for YOU to prove the Inverse Square Law is NOT immutable, instead you've allowed your acolytes to be here starting up yet again on their usual name calling rants & nothing but stone cold silence from YOU. Benni, you are a thick, uneducated loon. If you want to talk to real physicists, why not post your idiotic crap on a physics forum? Too chicken, correct? The author of the piece is an English major! You need to be addressing your idiocy to John Wardle. And he would kick your uneducated arse into the middle of M 87!